DIY : sourdough hot no cross buns - plastic free! 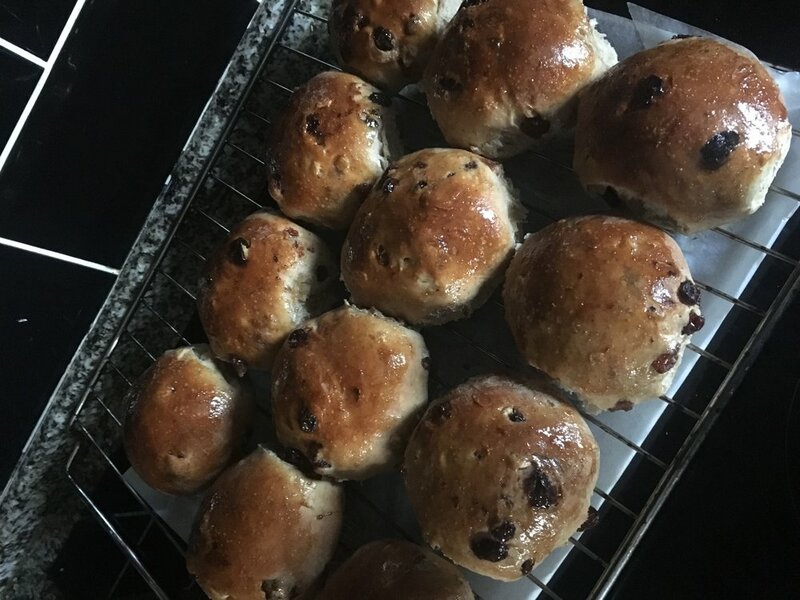 Who doesn’t love a hot cross bun?! Well actually Jack isn’t the biggest fan but Gemma loves them so set out on a mission to make some zero waste, avoiding the annoying single-use packaging they often come in. We are a little lazy when it comes to baking so left out the crosses as didn’t have a piping bag and didn’t want to buy for just one recipe, hence the no cross! Make sure you have recently fed your sourdough starter and its ready to use. Make the dough by placing the flour and spices into large mixing bowl and stir in sugar and salt. Rub in butter with fingertips, then stir in raisins and mixed peel. Make a well in the centre. Drop the egg into the well and add the sourdough starter. Add most of the water and mix to a soft, slightly sticky dough, adding the remaining water if needed. Turn out the dough and kneed gently, until smooth and elastic and no longer sticky. Place in a lightly oiled bowl, turning to coat the dough in oil. Cover and leave in a warm place to rise for about 12hrs. Next, turn out and lightly knead the dough. Divide the dough into 12 and roll each into a ball. Place on a greased baking sheet. Cover loosely and leave in warmish place for 10-12 hrs / overnight until doubled in size. Bake for 20-25 mins until risen and golden. While the buns are baking you can make the glaze, placing the sugar, water and spice in a pan and heat until sugar dissolves and water evaporated. Once buns are cooked transfer to wire rack and brush tops with sugar glaze. Enjoy! Can be frozen for up to 2 months. DIY : halloumi cheese - plastic free! We love cheese but often struggle to find it without plastic packaging, especially halloumi so we thought we’d try making it ourselves. While our first attempts are not going to win any fancy food competitions it does taste like the real thing, so we’re super happy! rennet - we bought veggie rennet, you can also try making your own from nettles but we didn’t have success with this! Gradually heat milk in pan to 32-36 degrees Celsius, take off heat, add rennet (follow instructions on bottle for how much to add), stir gently and let it settle for 1 hr, in which time it should set like jelly. Cut the jelly like substance (curds) into 1 inch cubes in the pan and let leave it to settle for another half hour. Bring the mixture up to approx 38 degrees Celsius over a gentle heat, taking around half an hour. Set up a sieve lined with muslin cloth over a bowl and use large perforated spoon to scoop the curds into the muslin lined sieve and leave for an hour to let the whey drain away from the curds. Slice or shape the curds into oblong shapes. Heat whey to 85 degrees Celsius, add 1 tablespoon of salt and once at temperature gently place the cheese curds into the hot whey to poach. The cheese will rise to the top when its ready, this can take up to half an hour. When risen remove cheese and leave to drain and cool. The cheese is now good to eat or you could store in brine. We’ve found that once stored in brine the halloumi becomes more like the regular squeaky halloumi found in stores! To make brine add half litre of whey to half litre of boiling water with 100g of salt, allow mixture to cool and then pour cool brine over cheese in an airtight container. Any left over whey can be used in vegetable stocks, used in cooking to replace water and can be substituted for skim milk in most baked good recipes that require milk so don’t throw it away! We get through quite a bit of citrus fruit and are always looking for fun zero-waste tips for left overs, so we were excited to try this recipe we found on Farmdrop. Our method ended up varying slightly to theirs and having only done it once so far our only advice would be to go with what you think looks best! left over citrus peels - start saving all your citrus peels in the fridge, you can either look to do all the same or a mix as we did, all depending on what type of squash you are hoping to end up with! We saved up until we had a decent bowl full (weighed around 700g and produced approx 250ml squash). Weigh citrus peels in bowl, the farmdrop recipe then recommends adding an equal measure of caster sugar but we ended up only putting in about half of the amount as it looked like too much - we used enough to make sure all peel was well covered - it does look like a lot of sugar! Mix together thoroughly and then leave on the side covered with kitchen towel. Again this is where our experience varied from farmdrops who advise leaving for a few hours/overnight, ours was left for a good couple of days before the sugar had properly broken down and all the juices had come out of the peels - we would stir every so often and just left it until it looked like squash! Once we were happy we simply strained the squash from the peels and put into an upcycled glass jar and kept it in the fridge, ours has lasted a few weeks with no problems. A great little extra product to get out of those left over peels and no more plastic bottles for squash! We then rinsed off the sugar from the peels and left to dry out in front of the fire, once dried we then use as little extra firelighters - they really help out in the wood burner! Did you know that the 24th Feb marked the start of Real Bread Week? A celebration of fresh, additive free, baked bread. Nothing beats a freshly made loaf and having gotten out of the habit of making our own (we’ve been pretty spoiled by all the fabulous local bread-makers we meet at the markets!) we thought this was the perfect time to start baking again. We absolutely love sourdough with its unique taste and ancient history. Instead of being made with cultured yeast, sourdough bread is made by the fermentation of dough using naturally occurring lactobacilli and yeast. Because flour naturally contains a variety of yeasts and bacterial spores, when added with water, the naturally occurring enzyme amylase breaks down the starch into the sugars, glucose and maltose, which sourdough's natural yeast can metabolise. With sufficient time, temperature, and refreshments with new or fresh dough, the mixture develops a stable culture, known as a starter. Luckily one of our lovely customers gave us a sourdough starter, but you can see how to make your own starter here. Due to its fermentation time sourdough is thought to contain less gluten than regularly baked bread and can be an option for those that are gluten intolerant. It also has a much longer shelf life as well, not that it ever lasts long in our house! We have trialled a mixture of different methods to bake our sourdough and have had success with the below. A few days before you want to bake your loaf you need to start feeding your starter to make sure its nice and lively. Most people recommend using equal measures of water and flour to the measurement of your starter (e.g 100g starter needs 100g flour and 100g/ml water). After feeding leave starter for 12hrs in a warm place. Keep it covered but not airtight as it needs to breathe. After 12hrs the starter would have risen and start to bubble, a sign of a good starter is no liquid on top and lots of bubbles. Now your starter is ready to go. For one loaf take 285g of starter (make sure you have some starter left over to make another batch), 425g bread flour and 9 g salt. Mix together in a bowl and then mix with enough water to make a sticky dough, slowly add the water to ensure right mix. Use your hand or a scraper to mix the dough. For 10 mins you’ll need to knead your dough, using your palm and the full force of your body to thoroughly work the dough. Now leave the dough in a bowl, cover with beeswax wrap and leave in a warm place for its first rise, usually for around 4-6 hrs. Next, re-knead the dough to remove air and then you’ll need to shape so the dough feels firm and soft, we’ve found using an envelope technique best to create a seem and shape (see minute 5 on this video). Place a tea towel in a bowl, cover with flour and then place dough inside bowl so seam is facing up. Wrap towel over top and cover with beeswax wrap and leave for its 2nd rise - depending on your timings either leave at room temperature for around 6 hrs or leave in fridge for around 12hrs. Your dough is now ready to bake. Set oven to 230 degrees centigrade and place dough onto pizza baking tray, seam side down. You’ll need to score the top of the dough to allow air to escape during baking (see minute 7 of video) Before placing into the oven make sure you either spray water inside or put a tray of ice cubes/water in the oven below where you’ll be putting the baking tray, this ensures a nice crispy crust that is a signature of sourdough. Bake for around 30 mins. You’ll know when its done as it’ll be golden and will sound hollow when you tap the bottom. You should then have a beautifully baked sourdough loaf, no additives, no plastic packaging! Want fresh smelling clothes and home without the plastic? 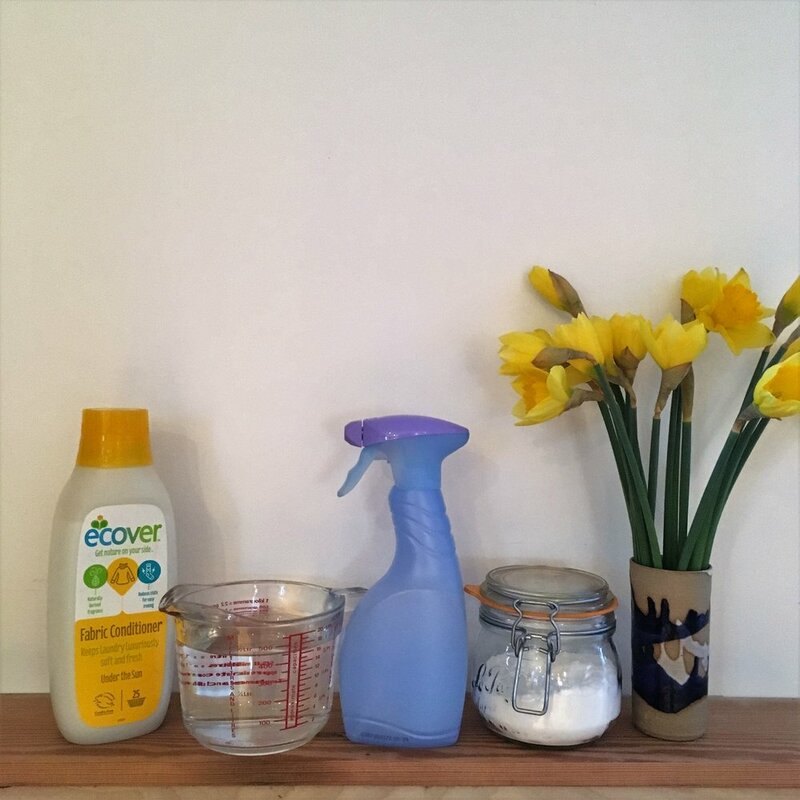 We make up our own version of Febreze to get rid of unwanted odours without the plastic waste, and its super easy. We find it handy to have around the house- means less washing! Using the volumes above will half fill a Febreze bottle, we find its best to make in small batches. Boil water in saucepan, once the water is boiling remove pan from heat. Add bi carb and fabric softener if using and stir to combine. Leave to cool. Transfer mixture to bottle. We found that sometimes not all the fabric softener combines so we run the mixture through a sieve to remove any lumpy bits left and then just pop these into the washing machine to be used in the next load! Shake bottle before each use as ingredients may separate. Use as needed. We found that this mixture is a little ‘wetter’ than traditional Febreze but does work to remove odours and freshen fabrics. The bi carbonate of soda helps absorb odours while the fabric softener adds fresh smell. For fans of yogurt it can be hard to avoid plastic with not many glass-jarred versions out there. But help is at hand because its surprisingly easy to make your own. You can decide how much time and effort you put in, some recipes call for constant attention but we’ve had success with an easy slow-cooker almost leave it to it recipe. You’ll need either a slow cooker or you can do with a saucepan and a thermometer to measure milk temperature. The total time making the yogurt mixture is around 3-4 hours and then resting tie of 10/12 hrs or over night - so plan accordingly! Make sure your yogurt cultures are at room temperature - so take out of the fridge and place on worktop. Place all milk in either slow cooker or saucepan if doing on hob. You want to get the milk temperature up to 85 degrees Celsius slowly, without burning the milk. You can do this on a high setting in the slow cooker or over a medium heat in a pan. This will take up to 2 hrs. You can decide how much attention you place on heating the milk. We’ve often just left the slow cooker to it and occasionally checked the temperature and given it a bit of a stir. If you are doing over a hob you will need to tend to it more ensuring you stir regularly to stop any scorching of the milk. Once at the desired temperature (and make sure it does reach this temp, we’ve often found the yogurt doesn’t take if it hasn’t quite reached the top temp) depending on how much time you have you can either keep it at that temp for a little while, up to 20/30 mins or you can start to cool the milk - we’ve heard that the longer you heat the thicker the yogurt. So turn off the slow cooker or remove from heat on the hob. You want the milk to slowly cool to 43 degrees Celsius. Don’t try to quicken up the process, this’ll take between 1 -2 hours. Once the milk has cooled, take your room temperature yogurt cultures and mix in a little of the warm milk, then gently but thoroughly stir the cultures into the milk - don’t use circular motions but use an up and down and side to side motion (we’re not sure why)?! Then place a lid on the slow cooker / saucepan and wrap in a large towel to help retain heat and let it sit for 10-12 hours / overnight. You should then have yogurt! If you desire thicker yogurt you can look to strain the mixture through a muslin cloth to separate the whey but we often don’t bother / need too. Jar up your yogurt and place in the fridge - make sure you save some of your yogurt in a separate jar to have ready to make your next batch and you should never have to buy yogurt in a plastic tub again! Occasionally you may end up with yogurt soup where the mixture hasn’t set - this has happened to us once so far, we’re not sure why, potentially the milk wasn’t hot enough, but whats left is still good enough to eat and use and will still have plenty of good bacteria!